This is my first publication. I created this out of concern I’ve had for fish that are red-listed (or endangered) because of poor fishing practices or lack of regulations. To write this book, I enlisted the help of my father to keep my grammar and spelling under control. Since I moved out of Chicago and away from my entire family, the creation of this book also served as a fun way to help stay connected with them. 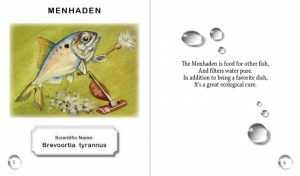 The first part of the book are made up of colorful and informational poems and pictures. 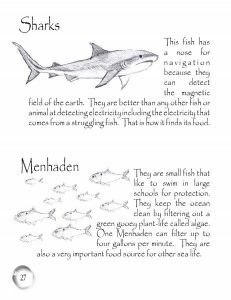 After the poetry and pictures, the back section of the book contains more realistic sketches of each fish and more in-depth information for the parent or older child. 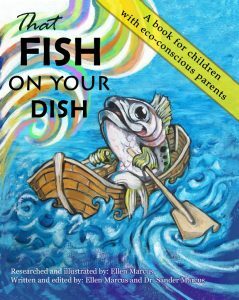 In the end we had a lot of fun writing this book, and we hope you and your child enjoy reading it together for the benefit and future of that fish on your dish. (Special thanks to Dr. Mark Sabaj Pérez, Dr. Jason Downs, and Nate Bender for their fact-checking abilities to ensure that all information represented is accurate and relevant). Without them, this publication would never have been as accurate.